Posy is happily waiting for her cupcakes to bake when a big blue monster appears. She feels scared and begins to cry. She soon realises that it’s only her friend Pip dressed up in a monster costume and this makes her feel better. Pip gives the costume to Posy, so she can have a turn being the monster and they spend the rest of the day playing together. 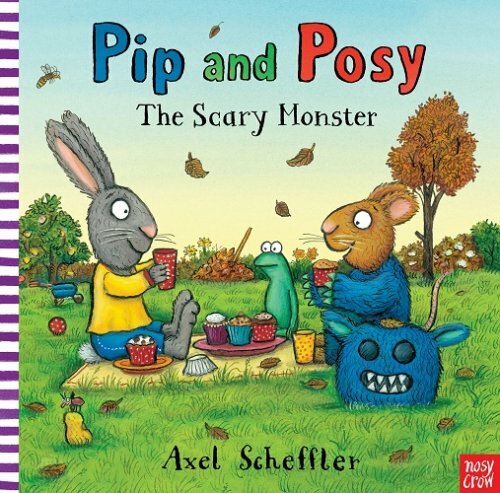 This book is part of the Pip and Posy series by Axel Scheffler. Pip and Posy find themselves in everyday situations that most toddlers & preschoolers will find themselves in. The Scary Monster is a simple story that little ones will enjoy listening to and retelling. Masks and costumes can be scary for little ones. So, this picture book is perfect for helping toddlers prepare for holiday celebrations, such as Halloween. The book explores the ideas of things not always being as they seem, and that people can dress up and pretend to be something else. Children can practise their ability to make inferences by predicting who might be in the monster costume. For further speech and language targets in Pip and Posy - The Scary Monster, see the list below.